The Promised Messiah (as) has, in light of the Holy Qur’an and the Hadith, expounded this matter in great detail for our guidance. For instance, what is virtue? How can one achieve true virtue? Why is it necessary to believe in God Almighty in order to [be able to] perform good deeds? What should be the standard of one’s belief? How can we enhance the standard of this belief? What are the means for doing righteous deeds? What are the various aspects of virtue? How many kinds of righteous deeds are there? How does Allah the Exalted reward those who perform righteous deeds? He has also stated that it is [a requirement of] virtue to perform even lawful deeds in moderation. If one transgresses it, it will lessen the virtue. Now, I will present some excerpts by the Promised Messiah (as). Elucidating as to what the nature of virtue is and explaining that even an apparently minor good deed can make one worthy of the pleasure of Allah the Exalted, he states: “A righteous deed is a ladder to rise towards Islam and God. The reality of a good deed needs to be borne in mind.” … Satan misleads people in every way and leads them astray from the path of Truth. The Promised Messiah (as) gave the example of a self-indulgent person, who chooses to donate left over bread to a hungry person, despite having freshly prepared meal to hand. This does not comply with the Divine commandment that Allah the Exalted says: And they feed, for love of Him, the poor, the orphan, and the prisoner. He did not feed poor from what was Tuam (means desirable food) for him, but from the left-overs.’ This is not a true act of virtue. To attain a true act of virtue demands a lot of self-reflection and endeavour. True virtue cannot be acquired without having absolute faith in God Almighty. Tre virtue is attained when one develops a faith in God Almighty as All-Seeing, Who is totally aware of everything and possesses knowledge of the unseen. The Promised Messiah (as) said, ‘Thus, in order to reform one’s morals it necessary to have faith in a Being, Who is ever watchful over him, his actions, his deeds and Who is a Witness for the secrets of his hearts. Thus, this is none but the Being of God the Exalted.’ Hence, only if a person has faith of this standard and is ever mindful of God Almighty will he be able to truly act virtuously. The Promised Messiah (as) further said, ‘In the sight of Allah the Exalted, Islam is not the name of refraining from vices. Rather, until a person does not adopt virtues, whilst abstaining from vices, he will not be able to survive in this spiritual realm. The truth of Islamic teachings is to increase and improve one’s spirituality.’ The Promised Messiah (as) said, ‘Virtues are like food. In the same manner a person cannot exist without food, he will seize to exist until he adopts virtues. This state is acquired by increasing in faith’. Then explaining the different aspects of virtue the Promised Messiah (as) states: There are two very important things for a human being, that is to safeguard from evil and to strive towards virtue and there are two aspects of virtue; one is to abstain from evil and the other is to do more good. To shun evil is one aspect of virtue but the other aspect is to actually do good yourself. Faith is complete when we carry out virtuous deeds and become helpful for others. The Promised Messiah (as) continues to say “By doing so, we remain cognizant of our transformation and such standards are attained when we have firm faith in the attributes of Allah Almighty and understand them. We cannot eschew evil without this.” We should persistently study the Holy Qur’an and its commandments in order to understand the attributes of Allah Almighty. The Promised Messiah (as) says, “It is very important to become beneficial for others. People revere kings and fear punishments by the state and there are many who do not violate the law of the land. Then how can they disobey the commandments of God, Who rules over all, with such audacity? Is there any other reason for this apart from lack of faith in God?” Hence, as it has been mentioned before that such shortcomings exist when faith is weak. We recognise Allah Almighty as the All-Knowing and the One who has the knowledge of the unseen in terms of our beliefs, however, we fail to demonstrate this in our practise. This then leads one to carry out many evil deeds and such a person is unable to do good because of his weakness in faith. Then whilst explaining that virtue is to keep even permissible things within limits, the Promised Messiah (as) states: “The root of virtue is to not exceed in partaking of lawful pleasures and desires of the world. For example, God Almighty has not forbidden food and drink but if a man makes it his hobby of consuming the same food and drink night and day, then he has given it priority over his faith. The similitude of this is like the horse cart driver when he travels a long distance then after approximately 15 miles he feels the fatigue of the horse and allows it to breath, stops and feeds it in order to remove its fatigue. Hence, in the same way the prophets partake of the delights of the world. Prophets also eat and drink but also partake of the delights of this world. They marry, have children, eat and drink. Prophets also partake in all these things. The Promised Messiah (as) states: “The contentment they receive from worldly entities is of this nature, for the reason that the reformation of the world was a task assigned to them. If the grace of God was not with them then they would have perished. Once, someone levelled an allegation against the Promised Messiah (as) to Hazrat Khalifatul Maish I (ra) in which he stated that the Promised Messiah (as) also ate Pilau [traditional Indian rice dish]. The person making the criticism said that he heard that Mirza Sahib ate Pilau. Hazrat Khalifatul Maish I (ra) in his reply to him said, ‘I have never read anywhere, neither in the Holy Quran or the Ahadith, in which it states that it is forbidden for the prophets to eat this. What harm is there if he eats this dish?’ The Holy Prophet (sa) once told a companion: ‘I eat good food, wear good clothes, have married and had children, I sleep and also worship. Therefore, you should follow my practise.’ It is a virtue and righteous act to keep a moderation in even those things which are permissible. The Promised Messiah (as) further states: ‘Remember that god Almighty is well pleased with good deeds and He desires that one should show sympathy to His creation. If He desired for ill-deeds then He would have urged one to do so, however God Almighty is pure of such a thing – Holy is He, and great is His majesty. May God Almighty enable us to perform good deeds in order to attain His pleasure and may we attain the target of, ‘Vie with one another in good deeds’ which God Almighty has set for us. After the Friday Prayers, I shall lead some funeral prayers in absentia. The first funeral is of respected Hamid Maqsood Atif Sahib, who was a missionary of the community and the son of Professor Masood Ahmad Atif Sahib. He passed away at the age of 48 at the Tahir Heart Institute in Rabwah on 22nd October due to kidney failure. Surely to Allah we belong and to Him shall we return. The second funeral is of Ali Saeed Musa Sahib, the former Amir [national president] of Tanzania, who passed away on 30th September at the age of 60 – Surely to Allah we belong and to Him shall we return. ghty enable them to continue his good deeds and may He elevate his status. The third funeral is of respected Nusrat Beghum Sadiqa Sahiba who was originally from Gurmaula warka but was presently residing in Rabwah. She passed away on the night between 16 and 17 October in Tahir Heart Institute. Surely to Allah we belong and to Him shall we return. She was the mother of Momin Tahir Sahib, who is in-charge of the Arab Desk. Her most notable quality was her great love in Tauhid [belief in the oneness of God] and completely despised shirk [idolatry] and harmful innovation in faith She observed her prayers with great fervency and regularly recited the Holy Quran. 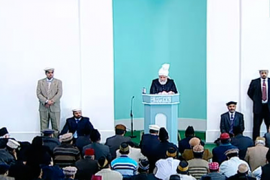 Huzoor (aba) prayed that May God Almighty elevate their status and enable their families to follow in their footsteps.